CoolFlatRoof.com has its own YouTube video channel, where we post videos of the work we do, as well as educational videos about all aspects of roofing. Check CoolFlatRoof.com video channel on YouTube, and please subscribe. Let’s look at the above statistics for a minute. I think that they are great for a ROOFING video channel. As mentioned before, roofing is only interesting when your roof leaks or if you want to replace it. So having 550+ subscribers is a great success. Of course we want more people to subscribe all the time, but it is an accomplishment for me personally. 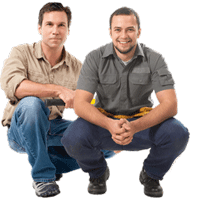 We’ve been using YouTube to host our roofing videos since 2008, and we’ve had a great success with it. We post interesting, informative videos on our channel, such as roof repair how-to videos, roof installation videos, and highlight “hacked” roofs. We also show / explain to our viewers why we think some roofing materials are not worth the time and money, and draw a connection between certain roofing materials and HORRIBLE roofing contractors that install them, as well as demonstrate that one often means the other. Note: I will soon upload a series of new videos demonstrating poor rubber roof installations – in particular, one that we just inspected in Brockton, MA, and start a new series, called Horrible Roofing. * Watch this 6 years old badly-leaking rubber roof video to see an example of bad workmanship and low-quality roofing materials. Why do we draw this connection? Rubber roofing requires a very small investment in the installation tools and equipment, whereas PVC requires a rather large investment in the tools and equipment (often in excess of 10,000 dollars) to be able to install it properly. The majority of hack roofers will never invest that much money in equipment, because they are not in it for the long haul. Thus, if you choose rubber roofing, there is a much greater chance that you will be working with an untrained, unprofessional roofing contractor who has little to no experience with flat roofs-a HACK roofer. Roofing Calculator APP for iPhone – This is our “side project” that we’ve been developing for some time now. 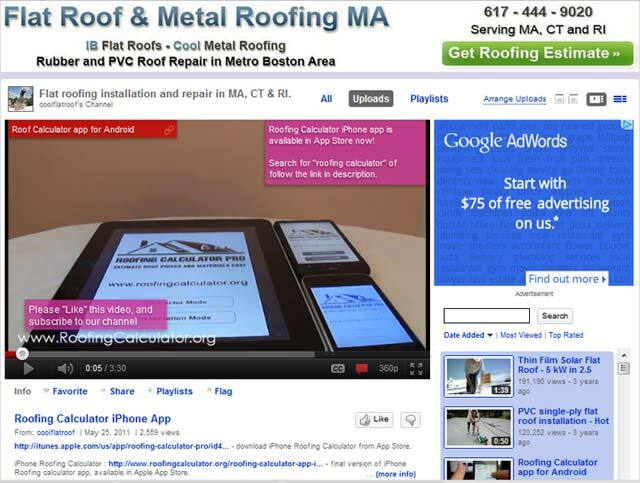 The Roofing Calculator app, which is now available for iPhone / iPad and Android phones & tablets, was originally developed for our in-house use, when we do roof inspections and estimates, and the idea was taken from our web-based roofing calculator tool that helps you estimate flat roof installation prices. The videos above are just a few of over a hundred videos currently up, and many more coming soon. In those videos you can view examples of our work – roof installation in Massachusetts, IB Roof installation videos, Metal Roofing installation videos for Tamko Steel Shingles and Decra Stone Coated Steel panels, rubber roofing installation and flat roof repair guides for tar, PVC and rubber roofing, In the near future we will add a number of Standing Seam metal roof installation videos that will cover every aspect of installing this rather complicated roofing material. Once again – subscribe and you will get regular updates when we post new videos.